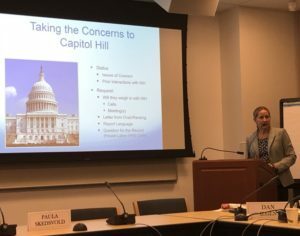 On October 24th, FABBS Executive Director Paula Skedsvold spoke to The National Academies of Science, Engineering, and Medicine’s Board on Behavioral, Cognitive, and Sensory Sciences about FABBS advocacy and education activities. Her presentation, FABBS: Promoting the Sciences of Mind, Brain, and Behavior at the Federal Level, provided highlights for the Board about federal discretionary funding since the Budget Control Act of 2011; federal science funding for NIH, NSF, and IES in FY 2018 and FY 2019; and details about the over $20 million cut to the NSF Social, Behavioral, and Economic Sciences Directorate in FY 2018. She also provided an update on activities related to NIH’s clinical trials policies that have captured basic science research involving humans, including two letters for NIH, one which describes the continuing concerns and a path forward and the other that responds specifically to the agency’s RFI on Registration and Results Reporting Standards for Prospective Basic Science Studies Involving Human Participants. Skedsvold concluded with FABBS efforts to show the value of research in our sciences through a series of upcoming videos and science writer articles, both of which attempt to convey how research is or can be used by policy makers, agencies, and the public.